Call of Duty's transformation into Crysis is nearly complete. 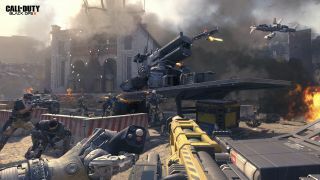 Treyarch's cyborg FPS now features 'Tactical Rig' abilities including enhanced vision modes, rocket-repelling armour, and magic definitely not magic boots that let you run along walls and jump multiple times in mid-air. The various upgrades for your Tactical Rig are detailed in the trailer above—but I'm much more interested in the following video. It's a livestream in which Treyarch reveals a brand new mode coming to Black Ops 3: Free Run mode. It's basically Mirror's Edge's time trials, and why not. Free Run comprises four, increasingly difficult obstacle courses set in apocalyptic, abstract voids, and fear not, there'll bits where you'll have to use a gun. Specifically, there are target boards that need to popped while you're gadding about. Black Ops 3 is out November 16, and Zombies mode, uh, found a way to recruit Jeff Goldblum.